Take part in half term family fun, celebrating diversity and art from around the world. All ages can join in free drop in drumming, dance and visual arts workshops, and learn about culture from India to China, Africa to County Durham! There will also be a Craft Fair in the building, so you can browse stalls selling local products, and grab a bite to eat. GemArts is thrilled to bring these local legends to Trimfest 2016. Booking Details : Call 01429 881 521 to book a place. Please take note of the age range for each workshop, and make sure you book on the most appropriate time for your child’s age. Halloween traditions are celebrated in many different ways, under many different names, around the world. Join GemArts artists for a special workshop – learn about different traditions and make your very own spooky artworks to take home. Booking Details : Call 01429 881521 to book a place. Please take note of the age range for each workshop, and make sure you on the most appropriate time for your chid’s age group. Young people are invited to join international performer and storyteller Peter Chand for an interactive workshop, which blasts the art of storytelling into the 21st century and allows young people to get creative. Engaging, energetic and educational. Suitable for any ability. Participants over 12 will receive a free complimentary ticket to Peter Chand’s Tongue Tied and Twisted at 6.00pm at Trimdon Village Hall. Workshop One 1.00 – 2.00pm: ‘Bringing a Story to Life’ (5-11 yrs) Gentle and fun workshop exploring the use of voice and movement in story, including imagination games to help young people bring stories to life. Participants will have a go at expanding and embellishing a story in this lively workshop. Workshop Two 2.30 – 3.30pm: ‘Tell it Well’ (12-16 yrs) More detailed exploration of storytelling performance techniques and storycreating skills. Looking at the use of voice, movement and imagination when telling a story, including practical examples of story-collecting and sharing. Children over 12 years of age and adults can also enjoy Peter’s performance of Tongue Tied and Twisted later that evening at Trimdon Village Hall. Booking Details : Call Trimdon Community College on 01429 881 521 for further information and to book tickets. 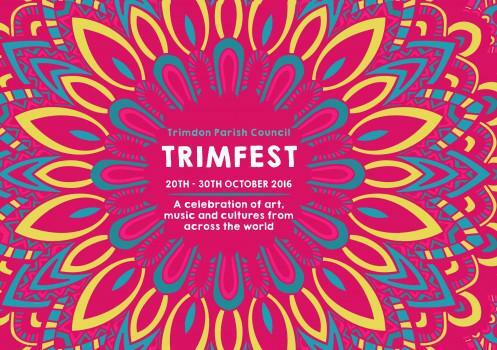 GemArts is delighted to bring Tongue Tied and Twisted to Trimfest 2016. Tongue Tied & Twisted blasts Indian storytelling into the 21st century, combining the talents of UK music producer PKCtheFirst on stage with international performer Peter Chand. Experience two distinctive artists bringing a fresh UK twist on traditional tales collected from South Asian elders. This show celebrates the art of live storytelling fusing a unique blend of Urban Hip Hop and classical South Asian sounds. Together, they present a unique audience experience across cultures for both young and old. This unique and vibrant story has been created by British Indian Storyteller, Peter Chand and UK music producer PKCthefirst, with traditional tales collected from elders in their community. Expect traditional tales told with a modern twist, accompanied by live DJ mixes and soundscapes. Suitable for adults and children age 12+. Booking Details : Call 01429 881 521 to book your place. This music workshop explores rhythm through improvisation, movement, body percussion, and drumming. Participants will be able to perform, enhance their cognitive and listening skills, and expand creative thinking while learning new rhythms. Booking Details : Call Trimdon Community College on 01429 881 521 for further information and tickets. This high energy ensemble is nothing less than exhilarating as it fuses together Afro-Caribbean and Latin percussion, Jazz, Afro-beat, Funk and Reggae to create their unique sound. Hannabiell and Midnight Blue are described by London based vintage afro-vinyl collector Volta 45 as “Afro-psychedelic funk”. The music created from this fusion is an organic blend of powerful and upbeat drums, brass, vocal chants and mbira compositions. All this not only produces an invigorating party atmosphere, it also encourages audience participation. Hannabiell and Midnight Blue is committed to playing music that helps to break down barriers, and GemArts can’t wait to showcase these exciting talented musicians at Trimfest 2016.